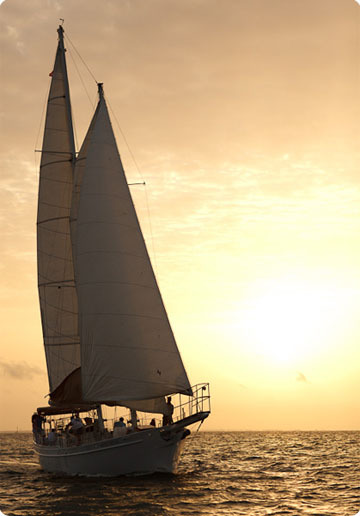 The St. Pete/Clearwater area has unlimited options for memorable group excursions, on land and on the water. Below is a small sampling of unique offerings. The St. Pete/Clearwater area is a peninsula, which means you're never far from the water. Take advantage of this unique location by holding an outdoor event off-property on an island. You can host a fully catered, entertainment-filled event on Shell Island, an undeveloped barrier island shaped by waves and ever changing tides. The island offers some of the finest locations for exotic tropical shelling found anywhere on the Gulf Coast of Florida. Shell Key is also a shorebird sanctuary, home to one of the densest shorebird nesting populations in the country. Sunsets on the water are especially unforgettable. VSPC can create your perfect event aboard a luxury yacht or sailboat. Caterers are at your service to showcase the tastes of the sea and provide libations for all to enjoy while taking in a beautiful Gulf of Mexico sunset. Sailing, salt water fishing and power boat cruising are all options for private charter celebrations that will leave lasting memories. Add style and colorful inspiration to your event by holding it at the Chihuly Collection, an intimate space displaying artist Dale Chihuly’s enthralling glasswork installations. In this 10,000-square-foot setting, attendees will be surrounded by massive yet intricate chandeliers and other works of art brought to life by dramatic lighting. Designed by award-winning architect Alberto Alfonso, the Chihuly Collection made its debut in July 2010 along downtown St. Petersburg’s Beach Drive – just a short waterfront stroll from restaurants, shops, art galleries and the historic Renaissance Vinoy Resort & Golf Club.